Growing up in suburban New Jersey, in the Imagination Age before my parents capitulated and bought a computer, I’d spend weekend afternoons on the floor of my bedroom with my globe in my lap. While my sister was at softball practice, I’d close my eyes and give the globe a spin. A moment or two would pass before I’d drop my index finger and let it skid 1,2,3 seconds across land and sea until the globe stopped. Nervous, I’d open my eyes. Wherever it landed, I would one day visit. If the location didn’t interest me — Australia, Ohio, the depths of the Atlantic Ocean — I’d spin again until I approved of the itinerary Destiny offered: Ireland, France, Uzbekistan, Vietnam. My calendar was booked for life! One corner of the world that always warranted a do-over spin was Scandinavia. There was no ancestral heritage to pull me, no cuisine to lure me and, save Queen Christina of Sweden, who died happily garbed in men’s clothes in Rome anyway, no historical figure deserving veneration. How shocked that 8-year old Jersey Boy would be to learn that his first stop out of the United States EVER would be neither Dublin nor Tashkent but Oslo. Low fares had led me to defy my cardboard crystal ball and choose Norwegian Airlines to carry me on the first leg of my journey to Tbilisi. 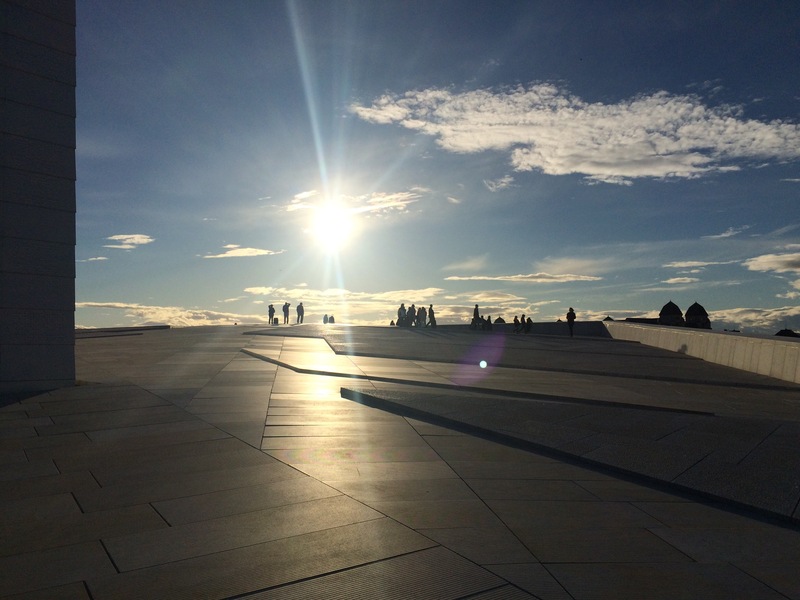 But it was the Oslo Opera House that convinced me to turn a layover into a one-night stand. And then, well, I did. I had only 24 hours in Oslo before my flight to Latvia the next morning. Fighting jet lag with adrenaline and caffeine, armed with intuition and Google Maps, I sauntered down Karl Johans Gate, the city’s main drag, everything a blur save the Romani beggars cloaked in black, prostrate over paper coffee cups at every corner. My first glimpse of the opera house was obstructed by cranes and scaffolding. Still, the peaks of white Carrara marble shone and soared in the light of early evening. I crossed a footbridge and stood on the shores of this manmade Everest. The indigo water of the fjord and the white marble splashed rays of sun into my eyes. Squinting, I turned to ascend the roof, first paying my respects to a statue of the great Norwegian soprano Kirsten Flagstad dressed as Wagner’s thirsty Irish princess, Isolde. The skyward angle of the roof forced me to shed my New York compulsion to rush forward. It was 5:15pm and the setting sun was to my back. The roof looked smooth and flat, but once I began the trek, I nearly tripped over the terrain of rising and falling marble which created cliffs and ravines that doubled as places to rest and talk. I made my way up to a rectangular stage of glistening marble at the summit. I scoffed at the steps in front of me and leapt onto it. The new terrain was rough and craggy. I felt like a pioneer discovering an untouched land of trapezoidal boulders blanched by the sun. The marble seemed to be in constant motion, tectonic plates pushing over and under one another in tense stillness. I was now at eye-level with the sun as it spread itself over high-rises and hills, skated on the water and generously, recklessly blanketed the shores of the opera house in light and shadow. I glanced at my phone for the first time in an hour. 6:15pm. Time to head to the box office. I bought a stool with an obstructed view of the evening’s performance of the ballet Manon. At intermission, I ate a soggy smoked salmon wrap next to the bust of soprano Ingrid Bjoner, a once glamorous opera star now immortalized in bronze with a matronly bouffant and neck folds. During the performance I witnessed Fate make and break promises to Manon until she died exhausted in her lover’s arms. I was glad that I had at last taken Fate into my own hands and was no longer that 8-year old boy seeking guidance from a piece of cardboard. The curtain calls over, I walked along the water one more time before I disappeared, anonymous as I had arrived, into moonlit streets of Oslo. A prophecy delayed. A wish fulfilled.